Regular readers of the PinotFile know that I have been a fan of the Pinot Noirs from Kent Fortner since the first vintage in 2001. 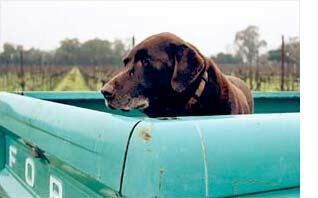 From 2001 to 2005, the winery was known as Green Truck Cellars, morphing to Road 31 Wine Co. with the 2006 vintage. Kent says that he was doing some family research in his hometown in Kansas when he saw a sign posted to a gravel road, “Road 31.” This road ambled past his grandparents’ homestead in Kansas. Kent’s 1966 green Ford truck, willed to him by his later grandfather, traveled Road 31 frequently. He decided to make the name change, thinking there were just too many truck labels, but he retained the picture of his green truck on the front label. Kent crafts his Pinot Noir in a portion of a barrel cave made available by friends who live in the Stag’s Leap District of Napa Valley. He is a one-man operation and likes it that way. His hands handle every step of the crafting from fermenting, to barrel aging, to bottling and peddling. He even delivers wine in his green truck whenever possible. Kent crafts roughly 700 cases of one wine: Road 31 Wine Co. Napa Valley Pinot Noir. Recent vintages are sourced from three vineyards: Nord Vineyard, located at the southern mouth of the Napa River where the water spills into the San Francisco Bay (clone 115), Stanly Ranch Vineyard in Carneros, just across the Napa River from Nord (114), and Suscol Ridge Vineyard, a mountain vineyard in Napa (Pommard). For Kent, the 2007 vintage was, “Truly a dream. We had cool weather, but not so much that botrytis invaded. We had a drought, but not so severe that we ran out of water entirely, resulting in perfectly stressed vines. We had extremely low yields with clusters so small that four of them would fit into your hand. Finally, we had shockingly even weather at harvest. Truly, a dream vintage.” As far as winemaking went, Kent said, “I couldn’t believe I managed to get through the perfect vintage without screwing it up.” The result is the best Pinot Noir Kent has ever produced. 14.1% alc., pH 3.62, 800 cases, $39, released June 1, 2009. Low yields, great color, brown stems. Low juice to skin ratio. The wine sat on its gross lees without racking for a year in barrel. · Opens beautifully in the glass over time revealing a complex aromatic profile of cherries, berries, spice, brioche, and forest floor. Vivid and full-bodied flavors of black cherry and black berry jam caress the palate with an attractive underlying earthiness and savoriness. Soft and smooth in the mouth leading the wine to literally slip off the back of the palate. A juicy and seamless wine that is nicely crafted and well priced. Way too good for the dog. 14.2% alc., 950 cases, $39. · Very charming aromas of ripe berries and cherries with a hint of cola. Earth-kissed black cherry and black raspberry flavors. A soil-infused, medium-weighted wine of great interest showing supple tannins, admirable finesse, and a dry finish. A solid wine, but not quite as good as the 2007 vintage. 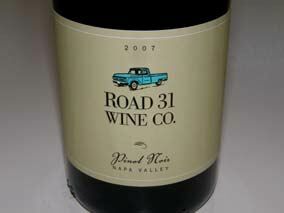 Road 31 Wine Co. Pinot Noir is sold primarily to “truckers” on the mailing list with limited retail distribution. The 2006 and 2007 vintages are sold out, but may still be found through retail channels. Add a case to your cellar and your friends will be green with envy (sic). The website is www.road31.com and the phone is 707-649-1200 (tasting by appointment). An informative “plog” is available on the website.